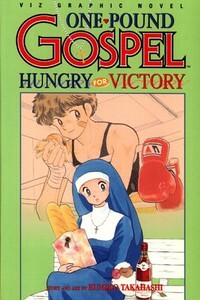 An unusual lighthearted romance, One-Pound Gospel records the exploits of one Sister Angela, a novice nun at St. Mary's, and the boxer Kosaku Hatanaka, who comes to see her for confession...and for her beautiful smile. Kosaku must wage constant war against his appetite (or fall out of his weight class), and Sister Angela must keep her faith against Kosaku's amorous advances. Kosaku fights two opponents, one who bears a deep grudge and another who is a trembling wimp inside.